Can we please get one thing straight on the suspension of radio host Paul Mushaben? No one violated his right to free speech. Nothing in the First Amendment prevents private employers from shedding themselves of workers who use their freedom of speech to offend great numbers of other people. Mushaben was one of the popular “Breakfast Flakes” on the local radio station Cat Country 102.9. I suppose everyone knows by now that he was indefinitely suspended for writing, on the radio station blog, that the Montana High School Association should consider separate basketball tournaments for Indian teams because of unspecified problems during some games. Those statements were admirably clear and straightforward, but backers of Mushaben, including people who marched in downtown Billings last week to show their support for him, insist that he is no racist and that his remarks were not racist, either. He was, they said, merely “telling it like it is,” political correctness be damned. There might not have been as much backlash if Mushaben had cited, with details, actual incidents, and then called for some kind of reasonable response—like, say, a meeting of adults to talk about bad behavior in general at high school sporting events. But he chose what you might call the talk-radio approach: just toss a bombshell out into the ether, then sit back and monitor the ratings. I haven’t listened to the Breakfast Flakes in years, but many of Mushaben’s other blog posts, while not as egregious as the one at issue, show the same sort of glib disregard for nuance, the same willingness to throw out bits of red meat for his followers. On Feb. 1, under a blog post headlined “Mexicans For Trump,” he cited the opinion of a man identified as Miguel—who was setting up beach chairs at the resort Mushaben was visiting. It was so absurd that I suppose it may have been satire. In a somewhat related post from January, he noted that President Obama was vacationing in Hawaii and he mocked people worried about climate change—or “proponents of colder temps,” as he called them—for not heading north instead. “Warmer weather is better for almost everyone and everything,” he added. In talk-radio circles, this passes for wit. Spoken like a true fiscal conservative. His remarks would have carried more weight, though, if he hadn’t pulled down just over $500,000 in USDA subsidies on his Broadview farm between 1995 and 2014. But who ever expected consistency from a talk-radio host? There is one more possible consideration here. 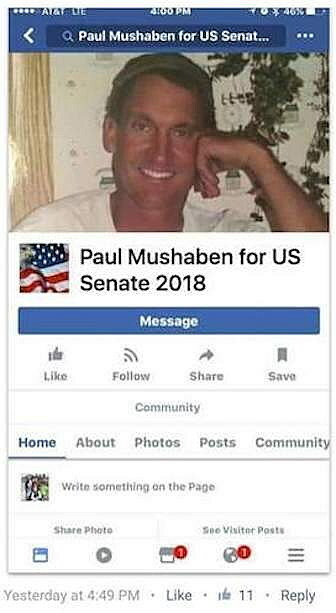 Although it’s no longer up, I have seen a screenshot of a Facebook page titled “Paul Mushaben for US Senate 2018.” I could not reach Mushaben to ask him about it, so I guess it’s possible that someone else created this page to encourage him to run, or even as a joke. But he would hardly be the first person to parlay media “celebrity” status into a run for political office. So maybe his supposedly offhand comment about segregated basketball tournaments was in fact an effort to telegraph his reactionary bona fides to potential voters. If so, his suspension will only help him. Now he can be an anti-PC warrior and a martyr. The most unfortunate thing about this whole mess is that it might now be more difficult to talk in a serious way about crowd behavior and racism and high school sports. We reported on the Pryor couple who complained of being the target of a racist insult at a high school basketball game. The principal of the school in question disputed their account, and I certainly have no way of knowing where the truth lies in this situation. But I was at the public meeting where that couple talked about their grievance, and what struck me most was that nearly every Native American nodded in agreement as they spoke, as if such things were hardly unusual, and some of them shared stories of similar incidents. That meeting, part of the Native American Race Relations and Healing Lecture Series, represented a thoughtful, deliberate approach to dealing openly and honestly with real-life problems. That was a far cry from Mushaben’s vague, inflammatory outburst. And that meeting was the beginning of a search for real solutions, not a crude suggestion to turn the clock back by decades. As Americans, as Montanans, we need more talk, and less talk radio.